across, and weighing almost 25 tons (22.5 tonnes). It was carved from basalt - a solidified lava, this being an area where volcanos were common. But then it was lost - buried under the central square of Mexico City - for over 300 years. interest in Mexico's ancient cultures. It was the Aztec calendar stone, or, more properly, the Cuauhxicalli Eagle Bowl. Antropología in Mexico, where it remains to this day. Quetzalcoatl - when will he return? While Christians and Muslims continue to await the second coming of Jesus Christ—and the Baha’i on the other hand say that this event has already occurred in 1844 AD with the coming of Bahaullah—the Mayans and many other South Americans still await the return of their beloved god Quetzalcoatl. Quetzalcoatl, who is also the Egyptian Wisdom-god Tehuti (Thoth), had cryptically promised them that he would return on ‘the thirteenth instance of my magic number’. Thoth-Quetzalcoatl’s ‘magic number’ is actually 52. But since the Mayan calendar ends abruptly on its thirteenth Baktun, many thought that this was the ‘magic number’ he was referring to…a number he also used often. What is a Baktun? It is a period of 144 000 days—a number or figure also associated not only with those to be saved at the ‘end of time’, but also with the number of blocks used in building the Great Pyramid of Giza. The name ‘Giza’ is a pointer to who the builder or great architect is. It is Thoth himself, whose Sumerian name was Ningishziddha, and ‘Giza’ is a further abbreviation of Gizzida, how he was affectionately called. As the Divine Architect, he is reputed to have built the three greatest pyramids of Egypt. Scholars have interpreted his return to come by the end of thirteen of these Baktuns, which gives 1 872 000 days, and they therefore divided this by 365.25 days to make 5125 years. They added this figure to the calendar that began on 3113 BC, and the date became 2012 AD. Now, let me add my own interpretation of this mystery. It seems to me that the date of 2012 AD is valid—but not correct. There are yet other levels to this. The first such level, as pointed out by author Zechariah Sitchin, is that the correct length of one Tun is 360 days (although Mayans were aware that the solar year is 365.25 days). This means the thirteen Baktuns (1 872 000 days) is now divided by 360 days to become 5200 years—100 lots of Thoth’s ‘magic number’. When added to 3113 BC, the new date becomes 2087 AD. The second level is one even Sitchin did not to take into account: what Thoth really meant when he said on ‘the thirteenth instance of my magic number’. As pointed out, Thoth-Quetzalcoatl’s ‘magic number’ is actually 52. Accordingly, my own analysis is as follows: to 2087AD, we must add 13.846 lots of 52 years, and we have 720 additional years that take us from 2087AD to 2807 AD. The figure of 720 contains 13 (almost 14) complete lots of 52—just as Thoth had said! 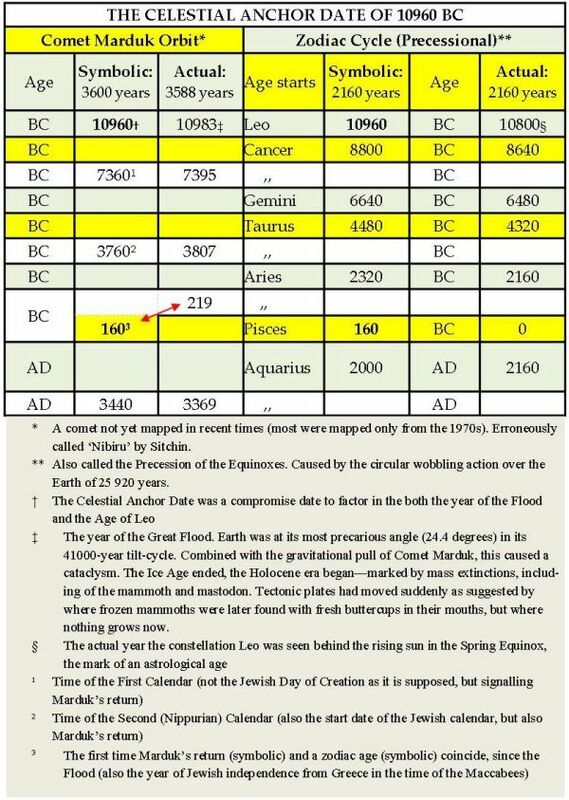 Interestingly, since the Earth moves one degree every 72 years (or 360 degrees every 25 920 years), 720 x 360 = 259 200…the number of 10 zodiacal cycles! When Hernando Cortez came to Mexico he found a great civilization of Indians, the Aztecs. Although they constantly waged war to take captives for bloody sacrifices, Cortez was impressed that their way of life was as orderly and convenient, and their standard of living" was nearly the same as in Spain. They had received their culture from the Toltec Indians, whom they had conquered a few centuries before, and from the ancient prophet-ruler of the Toltecs, Quetzalcoatl (the Feathered Serpent, as he was called). Just as the Spaniards made a slaughter of the Indians in the name of Christ, whose Message was of love, so had the Aztecs fallen away from the similar teachings of Quetzalcoatl. "Take great pains to make yourselves friends of God who is in all parts, and is invisible and impalpable, and it is meet that you give Him all your heart and body, and look that you be not proud in your heart, nor yet despair, nor be cowardly of spirit; but that you be humble in your heart and have hope in God. Be at peace with all, shame yourselves before none and to none be disrespectful; respect all, esteem all, defy no one, for no reason affront any person." Quetzalcoatl was described as a white man, with a beard, who wore long robes, and who gave a message of love, forbidding the blood sacrifice, teaching of the One Supreme God, and giving the Toltecs many material things of their culture, such as the calendar. He left the Toltecs because of the enmity and persecution of powerful religious leaders, but promised one day to return, as he had left, from the East, over the ocean. This "return" as has been explained in "Warriors of the Rainbow" (Warriors of the Rainbow, by William Willoya and Vinson Brown, Naturegraph Publishers), is by no means necessarily a return of the same physical Being, But can mean far more logically the return of the same Spiritual Message coming from another Great Prophet. Quetzalcoatl has been described by Dr. Herbert Joseph Spinden as "perhaps the most remarkable figure in ancient American history". He established not only a religion, but taught the people all manner of arts, sciences and useful social customs. Not all histories can agree on when Quetzalcoatl lived or even if he ever lived, though most tend to agree that he did exist. He has been called St. Thomas and even Jesus Christ himself. As to when he lived, there is not much agreement either, some saying he lived in the 12th century, others that he lived at the same time as Christ. Many historians, however, agree with Dr. H.J.Spinden, who states the Quetzalcoatl established the Toltec Era on August 6, 1168 A.D. and that most Mexican year counts begin with that date. A Toltec "era" was 52 years long, and calendar dates were based on cycles of 52 years. The Toltec and Aztec years were of the same length as our years, while those of the Mayas, as is explained later, were shorter than our years by 5 days. A. Hyatt and Ruth Verrill, in their book on America's Ancient Civilizations, tell us that most myths agree that Quetzalcoatl not only said he would return from the East but that before he returned bearded white men would come who would conquer the Indians and enforce on them a different religion. However, he said that when he returned all the ancient glory of the Indians would return. But what of the return of Quetzalcoatl? Various Writings say he spoke of a new religion coming in the 13th era. He would return, bringing a reign of peace, and the "advent of a new spiritual order". He would return as he had left, from the East, across the sea. He would be bearded, Caucasian and wear long robes. He said he would come in the year of his birth, but the only date we are given is the year of his spiritual birth, which is the birth of the Toltec Era, as described by H.J. Spinden, or 1168 A.D. The return in the 13th Toltec Era, as foretold in the prophecies, would not be earlier that 1844 A.D. It may be more than an amazing coincidence that 1844 was the year when millions of Christians all over the world were expecting the imminent return of Christ. The Millerites in American, for example, from whom are descended the present day 7th Day Adventists, were sure, because of the prophecies in Daniel 8:13-14 and in Matthew 24:15, that this event would happen in 1844. When nothing happened that year in the physically glorious form they imagined it would, they were much cast down and disappointed. It is extraordinary that few or any people had the wisdom to look back into history and see that Jesus Christ had not come in the way the People of His time expected. The people in the Holy Land in 1 A.D. all expected a great Messiah, but they thought He would arrive with great glory. However, the Messiah came with spiritual glory to test them, not in the physical glory they expected. The First Century of the Christian Era was like the dawn when the first light reaches only the mountain top so that only a few see and recognize the Sun of Truth rising above the horizon. Let us look then carefully to the year 1844 and see if we cannot find that a great spiritual Being same to men in that year, but was not seen by most of them because He did not come with the Physical glory expected. If so, then He fulfilled both the Biblical prophecies and those of the Toltecs and Aztecs. That there may have been two, not one, appearances of Prophets near the 13th Toltec Era is shown by the prophecies of the Itza-Maya. The Mayan people, so far as records show, were the first civilized people of Central America. They built great cities and two great flowerings of their civilization appeared, the first, or Old Empire, around 200 to 850 A.D., the second, or New Empire, from around 1000 to 1350 A.D. The stimulus for the civilization of the New Empire was largely due to the coming of Nahuatl speaking people from central Mexico called the Itzas, who were either related to or descended from the Toltecs and had with them the new religion of Quetzalcoatl (translated into Mayan as Kukulkan). The Itza-Maya had fallen away from this religion to a considerable degree by the sixteenth century, which probably was the main cause of the breakup of their civilization at that time. But that the Maya recognized the "divine source" of the Itza religion, even though it was now little followed, can be seen from a quotation which refers to their holy things being derived from Kukulkan (or Quetzalcoatl). 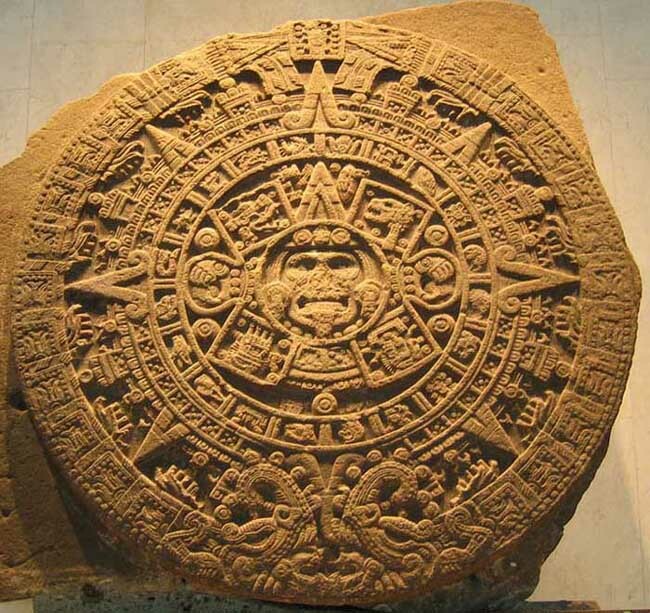 The Mayas had a calendar with cycles of 260 years. Since their years were only 360 days long, one of their cycles is approximately equal to 256 of our years. They called a year a "tun" and 20 years made a "katun". A Katun was named after the last day in it, which would be a day "Ahau", preceded by a number. A particular katun, like "Katun 5 Ahau" would thus recur every 256 years. Somewhere around the year 1500 A.D. there appeared among the Itza-Maya a famous seer or prophet by the name of Chilam Balam who foretold the coming of the white men and even gave details of the diseases and war they would bring and gave the dates of great disasters that actually came true according to his calculations on the Mayan calendar. It is the translations of his book of prophecies, called the "Book of the Jaguar Priest", made by Spanish-educated Mayan Indians into Latin script, but in the Maya Language, that we see today. The oldest and apparently most authentic of these translations is called the Book of Chilam Balam of Tizimin, and it has the extraordinary prophecies that we are going to quote here. It is quite evident that Chilam Balam was not only warning the Indians of the bad days they would suffer under white rule, but also giving them hope that one day their ancient glory would come back when a new religion would come that would bring all the world into harmony. "How can the generations of the sons of the Itza tell us the days of the prophecies and the days of the tun? How can we celebrate the rites of Lord 5 Ahau in the twelfth tun, when he comes in benign holiness. . . in Katun 5 Ahau, in the twelfth tun?" "Would that he might return (to) the west, uniting with us in commiseration over our present unhappy plight! This is the fulfillment of the prophecies of Katun 5 Ahau: the pottery jars shall be shattered into dust, when Run 19 arrives! At that time there will be imprisonment among the lords, when the prophecies have come true. There will be vigils in the overburdened katun. So be it." It is very interesting that imprisonment is spoken of here. Many Christians were imprisoned for their Faith, especially during the first two centuries A.D. The 19th tun of the 5th Katun began in December, 1868. It would thus seem evident that if we found a Prophet who proclaimed a world-uniting religion in 1862 or in 1863 and was imprisoned for this in 1868 or 1869, then this would be a proof that this prophecy literally came true. This would also agree in approximate time with the Toltec prophecy of the return of Quetzalcoatl in the 13th Toltec Era. But the implication is that there would be a coming of two great Prophets one right after the other! "One goes forth as ambassador. Another awakens Itzamna Kauil (God of the Heavens) in the west." "The temple receives its guests, the bearded ones from the lands of the Sun (the east). They are bringers of a sign from our Father God: blessings in abundance!" "I say that the divisions of the earth shall all be one!" the twin Prophet Founders of the Baha'i Faith. The time prophecies of the Toltec and the Maya indicate the beginning of a new era in 1844 AD. It was in 1844 AD that the Baha'i Faith began. These prophecies of the Toltec and the Maya have explicitly been fulfilled. They clearly foretell the coming of the Bab and Baha'u'llah, the twin Prophet Founders of the Baha'i Faith. Will the legendary Quetzalcoatl ever return, and if so when? Some crop pictures SUGGEST“three years” after December 23, 2012 when the Mayan Long Count CALENDAR ended, which might mean late 2015 or early 2016. Yet can crop pictures really reveal future events? While we were studying past seasons of field IMAGES in the Archives of Crop Circle Connector, we noticed that some crop pictures seem to suggest a near-future date in late 2015 or early 2016, when the legendary Quetzalcoatl might show himself OPENLY, or even land on planet Earth. Can such field images really reveal future events, or are they just artistic fantasies and speculations? The most “definite” crop picture of this kind might be Cooks Plantation of August 23, 2013. 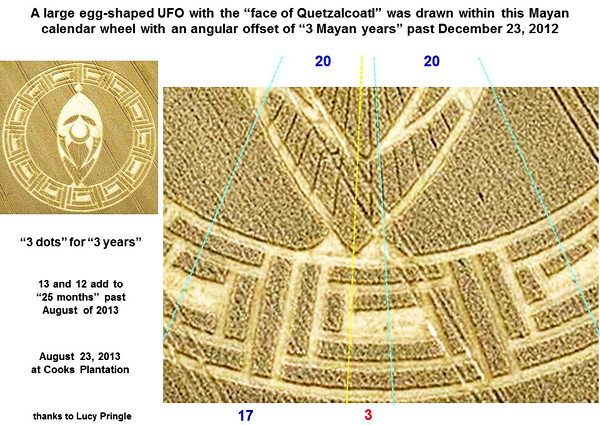 It seems to show a time period of “three years” from when the Mayan Long Count calendar ended on December 23, 2012, until we will supposedly see the “face of Quetzalcoatl” flying a large, egg-shaped spacecraft! Another “definite” crop picture might be Windmill Hill of July 26, 2011. It seems to show a near-future date in the Mayan Long Count calendar of 13.0.2.14.18, which corresponds to October 5 or 7, 2015 in our calendar. Will something important happen then? We also FOUND a series of less definite but still interesting crop pictures, which describe “Quetzalcoatl” or his supposed “return to Earth”, in somewhat vague artistic terms. Here we will bring such potentially important information to the public. Are some modern crop pictures meant to be interpreted factually? Or are they only fantastic images which emerge from the fertile imaginations of unknown crop artists, whether human, time traveller or extra-terrestrial? You the reader can decide! Next we can see 2 x 6 = 12 small “wedges” drawn just below that “lunar crescent”. These might plausibly represent the 12 lunar months of any “lunar year” (which has 354 days). Going outward from the centre, we can see three “long bars” which make up part of the “triangular UFO”. These have been labelled in red as “1, 2, 3” in the slide above. Might they be intended to SUGGEST an approximate time period of “three complete turns around the lunar CALENDAR” or “three lunar years”? One of those small “wedges” (near the bottom) has been divided further by a “thin LINE”, which is marked with a dashed red or yellow line in the slide above. The crop artists even drew a thin tuft of standing crop along that thin line, in the direction of the “lunar crescent”. That thin line adds one extra “lunar month” to the “wedges”, to give a total of 13 rather than 12. Might this “lunar calendar” imply a time interval of “three lunar years” plus “one lunar month”, thereby giving a date in late 2015 (three years after the Mayan calendar ended), or maybe in 2016 (three years after the crop picture appeared)? That is certainly an interesting hypothesis, but this particular field IMAGE remains cryptic and vague. Let us go on to study another crop picture with similar features, which appeared only ten days later on August 23, 2013, in the hope that its interpretation might be more clear and definite. The Mayans and Aztecs used a “Katun calendar wheel” to make near-future predictions. Such “calendar wheels” were described after Spanish conquest by the historian Diego de Landa (see www.sacred-texts.com). They were also used by the Aztec priest Chilam Balam to make his famous “katun” prophecies (see www.sacred-texts.com or www.famsi.org). In this context, each “Ahau” symbol represents 20 years or one “katun” of historical time. All 13 “Ahau” symbols, when joined together into a circle, add to give 260 years or 13 “katuns” of historical time. One such “Katun CALENDAR wheel”, with 12 “Ahau” symbols rather than 13, was drawn in crops at Smeathes Plantation on July 24, 2009 (see www.lucypringle.co.uk). Another “Katun calendar wheel” was drawn in crops at Cooks Plantation on August 23, 2013. This second example showed 13 “square spirals” around the outside (see above on the right). Such “square spirals” are more general symbols for “calendar time” in Mayan or Aztec culture, than “Ahau” symbols per se. When might this “new crop calendar” from August 2013 BEGIN? Thirteen “square spiral” symbols suggest that it may have begun six months earlier on 13.0.0.0.0 in the Mayan Long Count or December 23, 2012, when the old Mayan calendar came to an end. If this is the case, then its first “katun” of 20 years should extend in time from 13.0.0.0.0 until 13.1.0.0.0,which will be September 9, 2032 in the new Mayan calendar (one “katun” later). When we STUDY the centre of this crop picture using a high-resolution, aerial photograph (see www.lucypringle.co.uk), we can see two large “round eyes” and a curved “lunar crescent nose”. We can also see two “eyebrows”, two “long ears”, a “moustache” and a “pointed beard”. Might we be seeing here the humorous “face of Quetzalcoatl”? By legend, he promised to return to Earth soon after the Mayan Long Count calendar would end in December of 2012. Looking more carefully at fine details of this crop picture (see www.lucypringle.co.uk), we can see that his “beard” has been subdivided into 12 parts, while his “moustache” has been subdivided into 13 parts. Two large “round eyes” resemble the NUMBERS “0” and “0”. Each of his two “long ears” show three “small dots”. All of these details seem consistent with a Mayan Long Count date of 13.0.0.12.3 or August 23, 2013, when the crop picture appeared. What a joker, always drawing something clever and humorous! In ancient Mayan times, Quetzalcoatl was known as a “court jester”, and was even sculpted wearing a “three-lobed jester’s hat” (see www.bluffton.edu or www.lucypringle.co.uk orwww.mesoweb.com). More seriously, might this crop picture tell us approximately when Quetzalcoatl plans to return? The large “egg shaped UFO”, which appears near its centre with “Quetzalcoatl’s face” placed over it, was drawn in crops slightly tilted to the right, as noted by a small red arrow in the slide above. Such a tilt seems analogous to the “moving hour hand” of a “clock”. Since we know that each “hourly division” of this “clock” represents one “katun” or 20 years of historical time, can we measure its “angle of offset” very accurately, in ORDER to estimate when Quetzalcoatl might supposedly return? When we measure angles from this enlarged diagram, we find an angle of offset of approximately “three years” (red number “3”) out of a total “katun” time period of 20 years (blue numbers “20”). Could this be why his “long ears” were drawn with three “small dots”, since any “dot” stands in Mayan mathematics for the number “1”? Certainly an interesting calculation, but which calendar dates might other crop pictures suggest? A famous crop picture called the “Quetzalcoatl headdress” appeared on July 5, 2009 near Silbury Hill. Even at first glance, we can see two large sets of “seven quetzal feathers” near its centre. Might these “seven feathers” suggest “seven years” past 2009 until Quetzalcoatl returns? Studying this crop picture more closely, we can see that a curved “pyramid” motif has been overlaid among those 2 x 7 = 14 “quetzal feathers”. This “pyramid” shows two dot-and-dash codes as “10-15” on the left (marked in red above) or “9-16” on the right (marked in blue). Could those be month-and-year dates, for example “10-15” for October 2015 or “9-16” for September 2016? Just below, we can see the “face of Quetzalcoatl” as it was drawn on Mayan pyramids long ago (see Teotihuacan_Feathered_Serpent_(Jami_Dwyer)). This “face” motif consists of three small dots for his “eyes and nose”, plus a “pointed beard” which has been subdivided into 10 smaller parts. On left and right, we can see 7 or 8 “long wedges” which add to 7 + 8 = 15. Could three small dots for his “eyes and nose” represent “three years”, just as we calculated for Cooks Plantation above? And might that 10-part “beard” plus 15 “long wedges” be intended to repeat two coded numbers of “10” and “15” as drawn on the left above (marked in red)? Just one of those “square spiral” symbols, at Cooks Plantation on August 23, 2013, represented one “katun” or 20 years of calendar time. Five “square spiral” symbols match “day 5” of the month when this crop picture appeared, while seven “quetzal feathers” match “month 7” of the year when it appeared, on a date of July 5, 2009. Finally at both thin tips of that large, outer “lunar crescent”, we can see three “small dots” (marked with red boxes in the slide above). Might these mean three “brief periods of time” until Quetzalcoatl returns, since the “dot” in Mayan mathematics stands for a number “1”? Two other crop pictures on August 19, 2013 or August 23, 2013, as well as landscape features near a crop picture at Stonehenge on August 1, 2013, also showed those same “three dots” (see other “red boxes” in the slide above). That landscape symbol “10” has been used on several other occasions to help with “counting” by the crop artists. For example in 2012, we saw a “ten-pointed star” drawn next to the same number “10” (see www.lucypringle.co.uk). In 2014, we saw “full Moon” and “half Moon” symbols drawn not far away, to represent an astronomical date of “August 10”. For our crop picture from 2009, we can see that a large number “10” has been surrounded in the landscape by five or six bright symbols for the number “1”. When studied as a whole, all of these symbols seem to suggest a possible date of “10-15” which was coded within one part of the crop picture nearby (see above), or perhaps a date of “10-6” for the year 2016. August 16, 2014 at Nettle Hill: will we get an “eye opening revelation” during the year 2016, when an extra-terrestrial “gunslinger” comes to town? That “feathered headdress” from Silbury Hill on July 5, 2009 was drawn again in crops, on a miniature scale, at Nettle Hill on August 16, 2014. There it was included as part of an “opening eye”. Their “eye” motif showed 2 x 7 =14 “eyelashes” above the “pupil”, and 2 x 6 = 12 “eyelashes” below. This landscape feature matches “August 16” as the day when the crop picture appeared. Are they trying to tell us about an “eye opening revelation” during the upcoming year 2016? What a clever crop picture! Who might the mysterious “gunslinger” be? Who will be coming in the year 2016 to give us an “eye opening revelation”? At Nettle Hill in 2014, we can see “14 eyelashes” above the “pupil”, while a “tiny serpent” crosses the eye’s “field of view” from right to left. At Silbury Hill in 2009, we could see “14 quetzal feathers” above a “lunar crescent” which showed the “face of Quetzalcoatl”. Likewise along the top of Silbury Hill in 2009, we could see a large “zig-zag serpent” moving from right to left. Many clues from these two crop pictures therefore suggest that Quetzalcoatl (as a “Feathered Serpent”) might possibly return to Earth in a dramatic, eye-opening fashion during the year 2016, or late in 2015. The Hopi tribe of north America has a long-standing prophecy that a bright blue star will appear in the night sky, shortly before the return of their “true white brother” who is called “Pahana” (see Blue_Star_Kachina or www.youtube.com). This may be just another name for Quetzalcoatl (see www.rexresearch.com). Each of those large “rings” contains approximately 118 “small marks” made from carefully-laid wheat stems, as shown schematically on the right above. All three rings together create (3 x 118) = 354 small marks, which match the number of days in any 12-month lunar year. These match four “swirls” from a well-known Hopi cultural symbol, as shown on the left above. The crop artists could have added six swirls, but instead chose to add only four. Might these subtle additions be intended to suggest “four lunar years” past July of 2011, when the crop picture appeared? On that occasion, it showed a complex grid of “spacetime curvature”, while appearing under the “nose” of the same “native American” figure in the landscape. Its Mayan calendar date seems to read 13.0.2.14.18, going from the centre to outside. Several symbols within that crop picture match the orbital locations of Uranus, Saturn, Jupiter and Mars on the same date, which will be October 5 to 7, 2015. Two sets of “five small bundles” of crop along its outer ring seem to suggest that “14” and “18” are numbers in a five-digit Mayan calendar. As an aside, the “1-9-2 polar clock” from Chualar on December 28, 2013 suggests a similar date as “one year, nine months and 2/12 months” past the start of 2014. Alternatively if we flip Chualar upside-down, then its “polar clock” reads “7-3-8” and suggests a date of July 8, possibly in 2015. 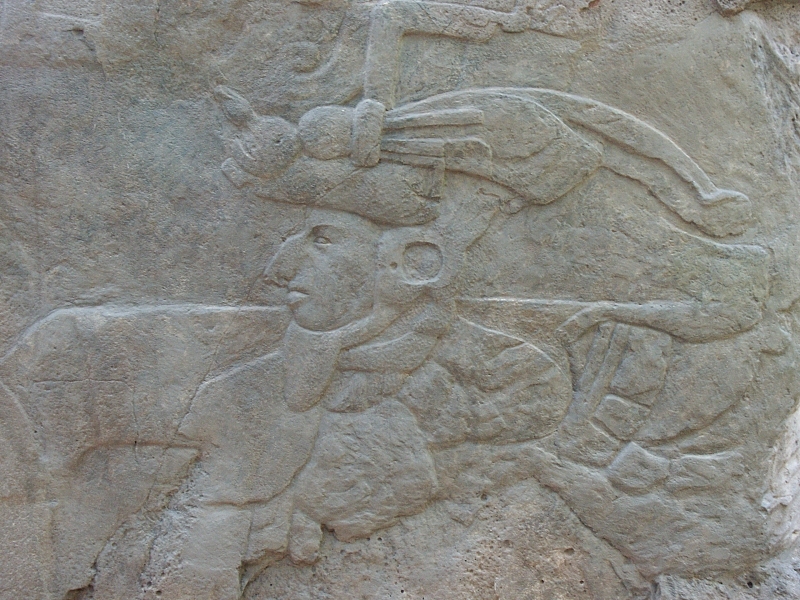 Just above in the landscape, we can see the fast-moving image of a “flying spaceship”, which also features the “face of Quetzalcoatl” in a side-on view. A small standing tuft in the upper crop picture (labelled with a yellow dot) points toward where the “pilot” of that “spaceship” would be sitting. The lower of those two crop pictures (shown at right centre) suggests an “Earth-Sun-Venus alignment” which happened three days later on August 16, 2011. The upper crop picture shows a “six-pointed star”, which resembles another image drawn in crops at Etchilhampton in 1997 (see www.lucypringle.co.uk). That 1997 crop picture and its companion described a transit of Venus across our Sun, fifteen years later in June of 2012. Why did those crop artists draw the same “six-pointed star” again in 2011? Could it have been to suggest that there might be only five or six Sun-Venus conjunctions left, until Quetzalcoatl returns? In other words, Quetzalcoatl seems to be planning to return to Earth with “great love” for the humans who live here in modern times! There we can see the schematic “head of an aviator”, with his “space shuttle” flying nearby! Along the “collar” of his flying jacket, we can see a small “lapel pin” which is based on the Chalice Well symbol from Glastonbury. The 2011 “smoking grey alien” is generally regarded to be a human-made fake, but who knows? Many crop pictures seem intended to be purely humorous. We will show a few more examples of the “funny” kind here. Who could be making such cryptically-humorous crop pictures, which only a few people on Earth today can appreciate? Especially because its scientists remain metaphorically “blind”? Truly this is a great mystery, which cannot be explained away by sceptics who put forward mindless theories of “men with rope and boards”, while never going out into the fields to see what is happening for themselves! Images of Quetzalcoatl from 2000 years ago in central America: an “ancient alien” who taught the Mayans everything they knew about mathematics, calendars, pyramids, astronomy and agriculture? Many crop pictures seem to revolve around “Quetzalcoatl” and his mysterious but promised “return to Earth”. Who was he really, when he lived with the Mayans at Teotihuacan long ago? Why did they build temples and pyramids in his honour? Was he a time traveller or ancient alien? Three different and authentic images of Quetzalcoatl from that era are shown in the slide below. What do you think? Local people have drawn many “white horses” in the landscape of Wiltshire. New crop pictures often point towards “white horses”, for example at Milk Hill, Hackpen Hill, Roundway or Hackpen Hill (see www.lucypringle.co.uk orwww.lucypringle.co.uk or www.lucypringle.co.uk). One can hardly avoid thinking here about “four horsemen of the Apocalypse”! Finally we have stories from recent UFO literature, for example from the Swiss contactee Billy Meier. He supposedly met an extra-terrestrial man called “Quetzal”, who travelled here with others of his kind from the Pleiades star cluster in a parallel universe (see www.futureofmankind.co.uk). In summary, the crop artist Quetzalcoatl seems to be a space traveller from the Pleiades M45 star cluster, whether in this universe or a parallel one. He and his people may have lived on Earth with the Mayans before, for hundreds of years. Some modern crop pictures appear to suggest his imminent “return”. When might that be? If we study modern crop pictures very carefully, we can see hints and clues for “three years” after the end of the previous Mayan Long Count calendar on December 23, 2012. This could mean late in 2015, or sometime during the year 2016. Whether these field images actually tell us true information about the future, or are just showing us artistic fantasies and speculations, is hard to say! Hopefully new crop pictures from the summer of 2015 will tell us more. P.S. We would like to thank all of the crop-circle researchers and photographers who have worked tirelessly to document this important phenomenon for the past 25 years, while modern science remains “blind” (John 9:41). There is a hypothesis that Quetzalcoatl (Rh-Negative blood factor) was a viking, sole survivor of a sea exploration. Or a Celtic person from the Tribe of DANA. Aug 8, 2013 ... The Mayan civilization had a particular fascination with Venus because it was associated with their chief god Quetzalcoatl and one of his .